Every Windows 10 systems comes with built-in real-time antivirus called Windows Defender. Unlike the basic Windows Defender, or its predecessor Microsoft Security Essentials, provided by Microsoft for previous versions of Windows OS such as Windows 7, Windows Defender Antivirus in Windows 10 is solid and good, and can perform its job in defending and protecting the security of your PC well, especially in view of its ridiculous price – free! As Windows Defender is built into Windows 10, it runs automatically in the background right after installation or PC set up, ensuring that all Windows 10 users are protected agains viruses, spyware and other malicious software. Beginning from Windows 10 Creators Update v.1703, Windows Defender’s user inferface has been revamped to be integrated with Windows Defender Security Center, which is the one-stop panel to various security options in Windows 10, for example, virus and threat protection, device performance and health, firewall and network protection, app and browser control, and family options. Windows Defender essentially runs and performs everything automatically in the background, e.g. scan downloaded files, scan files transferred or imported from external drives, scan files when accessed or opened in real-time. When something malicious detected, it automatically clean up and quarantine and files, with just a notification. It also updates latest virus signature automatically. Everything is done in real-time without your input and no action is required from you. But what if you want to manually run a antivirus scan, especially if you want to scan suspicious USB flash drive or external hard disk? Manual scan is useful when you suspect your computer may be infected with virus or malware, or you have just downloaded new virus definitions. Open Settings -> Update & Security -> Windows Defender, and click or tap on Windows Defender Security Center. You can also open Windows Defender Security Center directly from Start Menu or by searching. Go to Virus and threat protection module. To start the virus scan in common locations and memory immediately, hit the Quick scan button. Full scan: Checks all files and running programs on your hard disk, which could take longer than one hour. Custom scan: Choose which folder you want to check, useful if you want to perform the manual scan on external hard disk, network drives, shared folders, USB flash drives and etc. Windows Defender Offline scan: Windows will restart the device to run the scan with up-to-date threat definitions to help find and remove malicious software that is difficult to remove. 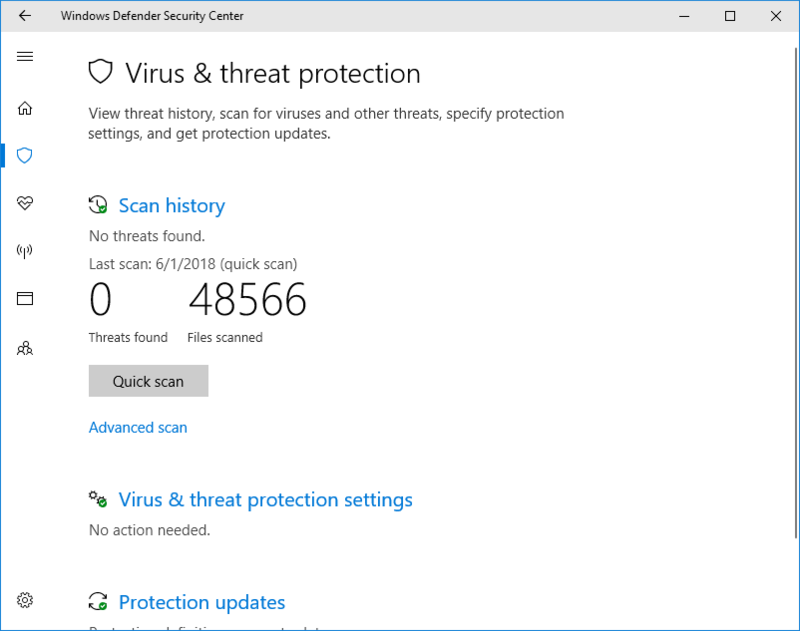 Windows Defender will report the results when scan is done. Right click on any file and folder (including the root drive for everything on that volume), and select Scan with Windows Defender. Windows Defender will automatically open to scan the content inside the selected location.